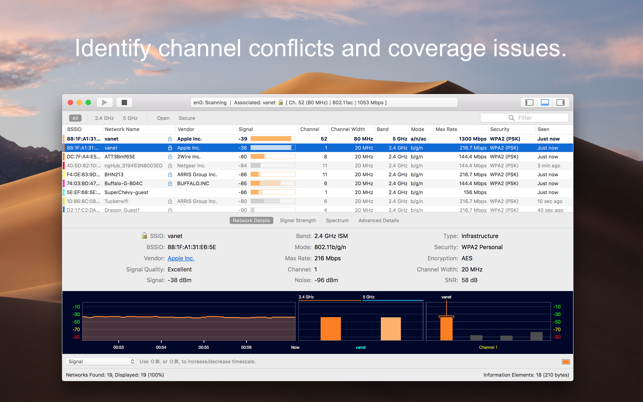 Get an insight into the network details: name (SSID), MAC address (BSSID), device manufacturer, signal strength (RSSI), noise, channel, band, security configuration, supported data rates, 802.11 information elements (IE), and much more. Requires a Mac with built-in Wi-Fi. External Wi-Fi adapters are not supported. • Fixed issues introduced after enabling sandboxing, such as inability to save or open scan results and other file-related operations. 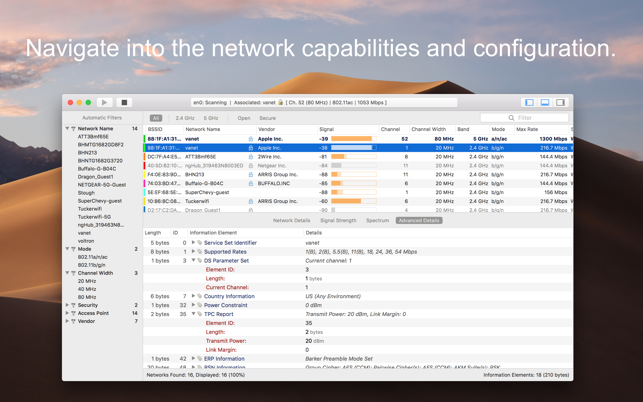 • Improved recommendations for certain network configurations. • Added Touch Bar support. You can now start/stop the scan, as well as quickly apply filters using the Touch Bar. • Added support for Mist AP names. • Added ability to filter by channel range. You can now use, for example, the filter expression 36-48 to display only the networks configured on channels 36, 40, 44 or 48. • Fixed some issues when resizing the main window. • Fixed appearance of checkboxes and other UI components when using dark mode in macOS Mojave 10.14. • Other minor UI tweaks and enhancements. 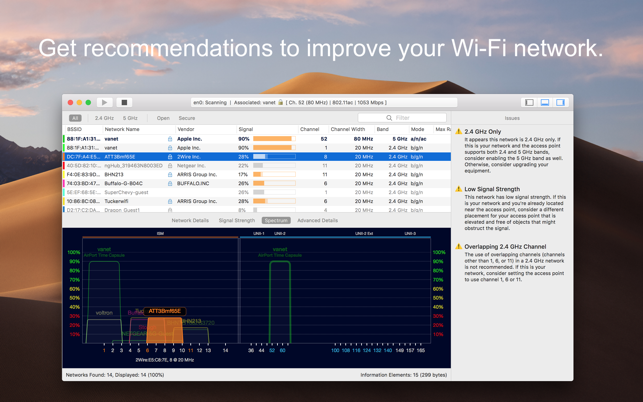 If you find WiFi Explorer useful and have a couple of minutes, please share your thoughts by leaving a review in the Mac App Store. It will make a huge difference to me! Found a problem or have a concern? Please visit the WiFi Explorer Support website, or @wifiexplorer on Twitter, and send me a message so we can resolve it. This is by far one of the most useful tools I have used and one of the reasons I even stick with Macs instead of going to Windows. 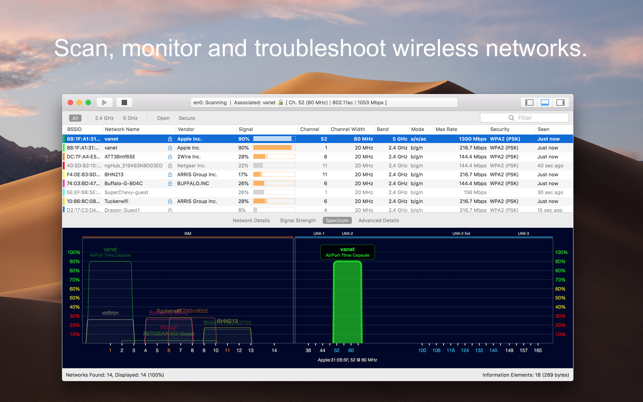 WiFi explorer has been used for countless projects and it comes in handy for troubleshooting and optimizing. I have used it recently to help install two Google WiFi setups at different houses with different layouts. Being able to see all of the devices as they come online and their signal strength and other stats was really helpful and educational. One observation that I was having is that my laptop at times was not connecting to the closest Google WiFi AP, instead it was holding onto to 2nd floor AP even when the signal strength was 10-15% less. These are the kinds of insights you don’t get often and it was cool to see how that worked. For work settings it has been useful to find down APs or research which channels to set devices too in a crowded building. 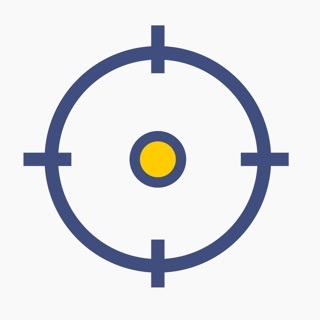 WiFi Explorer pays for its self in only a few uses, it is worth every peney and I am happy to see the developer continue to work on it and squash bugs. I’ve been using this utility for years. Anyone who has been profesionally trained on wireless installations knows that it is a practiced science, not an excact science. What works for one enviornment may not work for another. What works at one location in a building may not work 50 feet away in the same building. I use this software as a systems administrator to diagnose wireless performance from my laptop as I walk around the floor in our offices. This utility makes it very quick and easy to identify performance, and see how performance fluctuates as I wander from here to there, identifying deadzones, or areas impacted by high EMI and low SNR. I’d recommend this utility. The author does a good job deploying consistent and regular bugfixes in addition to feature improvements — updating it year after year and keep this program running reliabily as Apple releases their OS X platform changes. This app is great. I’d absolutely recommend it. I am the “mother-in-law” in our home ( see definition below * ). I live with my son, daughter-in-law, and three grandson’s. Use to have just one wireless Orbi WiFI mesh network for both sections of the house. Daughter-in-law requested a Disney Circle solution so I moved the Orbi mess network to her side of the house on DMZ’d connection off from main router so they are on a separate subnet. On my subnet network off from main router I have my own WiFI access point for my “mother-in-law apartment” side of the house. Now using my background in networking I setup both wireless systems. I purchased “WiFi Explorer” for iMac so I could see how well I did. Well, I did a good job, however “WiFi Explorer” did a better job showing me the spectrum that was being used by our neighbors, and our house. Using this program I was able to fine tune our homes two wireless subnet’s WiFI systems so they now do a better job of not overlapping the channel’s signals from all WiFI sources. So “WiFi Explorer” was well worth the money. * A “mother-in-law apartment” is an accessory dwelling unit (ADU), a separate living space that is either attached to or located on the same grounds as a single-family home. ADUs are also referred to as mother-in-law suites or guesthouses.